New pulling tower with smooth and accuracy displacement of 180º. Solid and compact frame with 3 m. length for any repair. Double safety device and twin lifting rams. 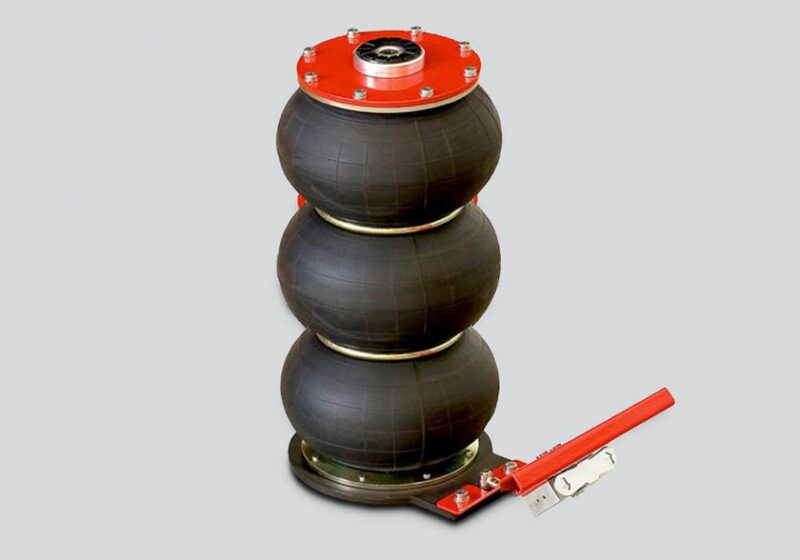 New pulling tower with smooth and accurate displacement of 180º. 3,3 m chassis with 45o corners for better side pulling. Double safety device and twin lifting rams. 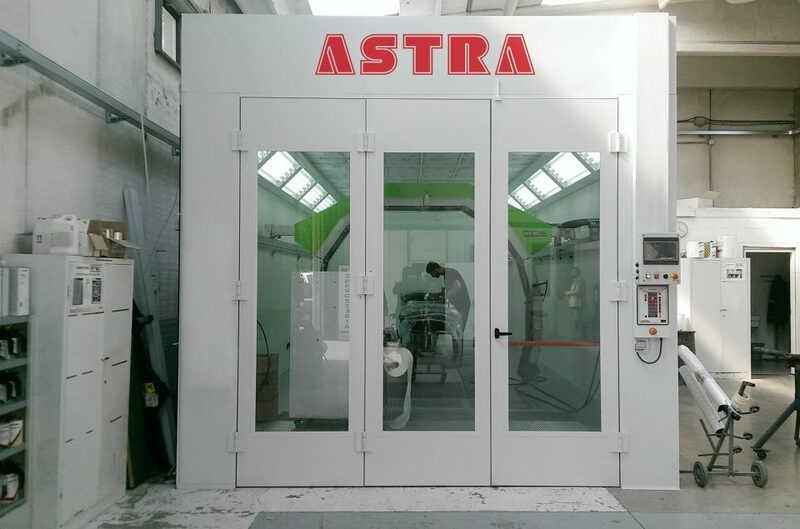 The Eclipse Series is, whithout doubt, the spray booth that offers the best performance and highest satisfaction to user. The professional that has got the will to achieve perfection at his work should provide his workshop with this spray booth model. The most demanding enterprises in the car manufacturing sector, such as SEAT and VW are achieving the best results throughout our new Eclipse Series. 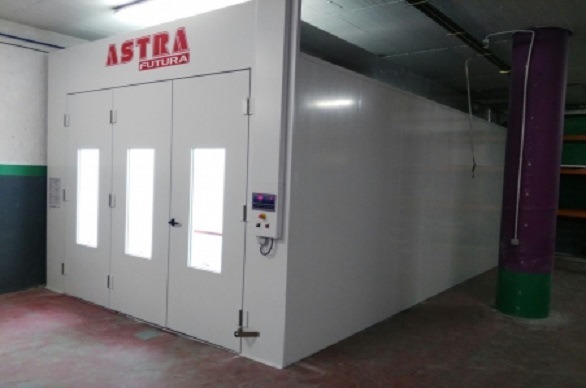 ASTRA 4 Series spray booths offer the best performance for the most demanding professionals. Repairs are done in less time, an average of 20% faster than a conventional spray booth. The air flow controlling systems installed within guarantee an optimal working environment, which is translated into dust free refinishings. The process of polishing, wich unfortunately is present at too much repairs carried out in other spray booths, dissapears in the repainting processes taken in 4 Series spray booths. 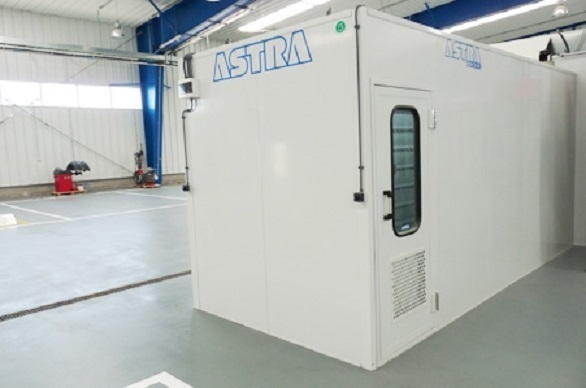 Este nuevo modelo de cabina de pintura, viene a completar la gama de equipos, que desde ASTRA ofrecemos desde más de 30 años al mercado. 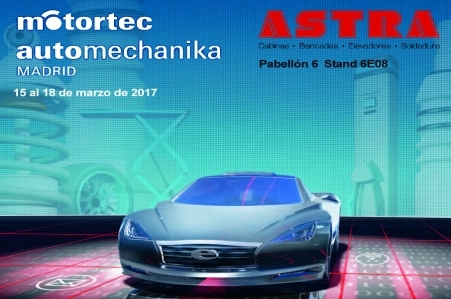 Nuestro departamento técnico ha desarrollado un nuevo concepto de cabina de pintura, donde eficiencia energética, calidad de acabado final y un precio competitivo pudieran encontrar un perfecto equilibrio. 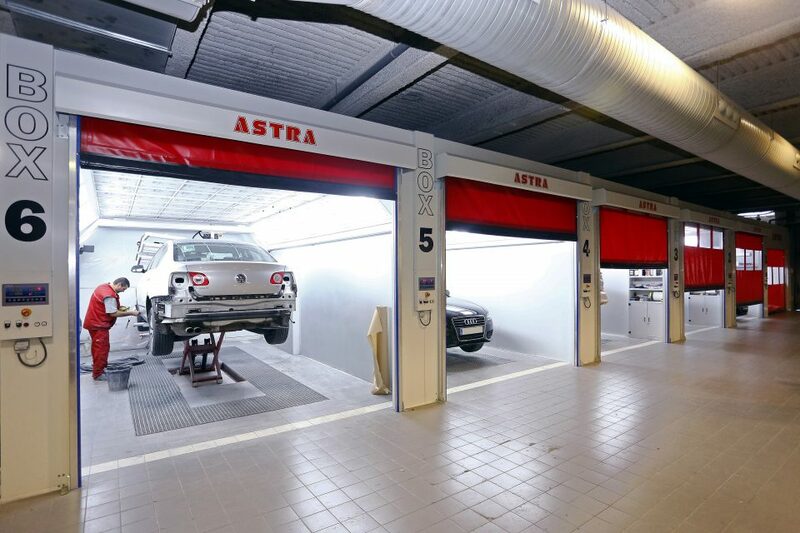 ASTRA preparation areas offer the best results when carrying small repairs. 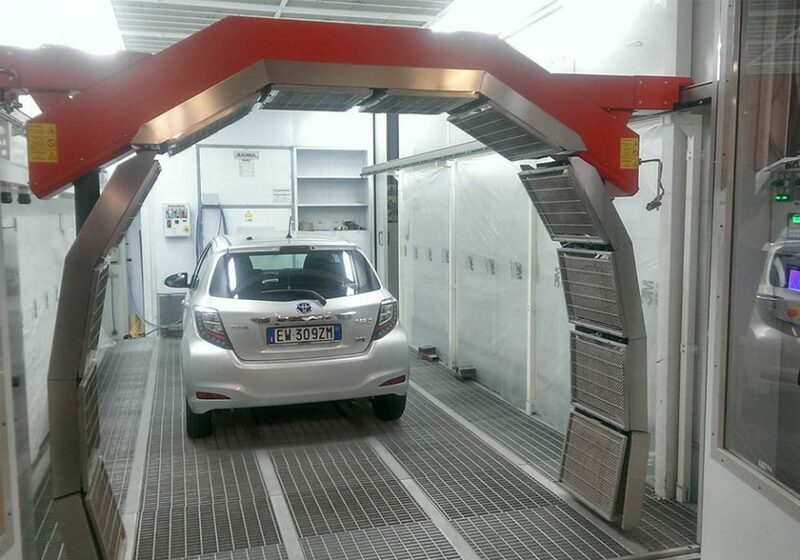 We guarantee the best lighting and air filtering (viledon) as we use the same elements installed in our spray booths. On that way we can guarantee quick repaintings whithout the need of polishing pieces. Due to a servomotor operated aluminium hatch we can pass through the sanding phase to the painting phase in a fast an quiet way. Our preparation areas deploy a system tha guarantees a constant air renovation during the painting phase, as well as a hatch placed in the plenum for thinner disposal. 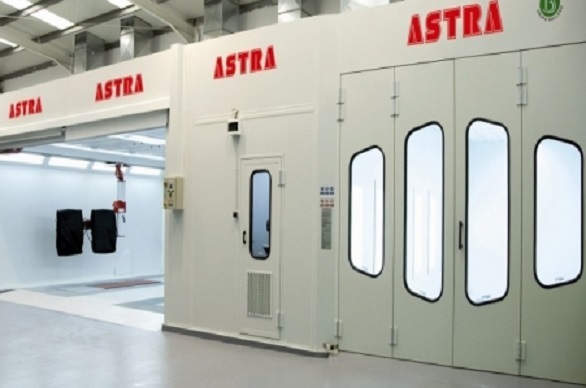 ASTRA paint boxes are manufactured with sandwich panels of 4 cm of thickness, twin lighting (watertight and temporized) as well as an extractor that guarantees a minimum of 50 renovations per hour inside the box. The gate is partially glazed with securit security glass 3+3 and provides a switch that guarantees the self-locking. 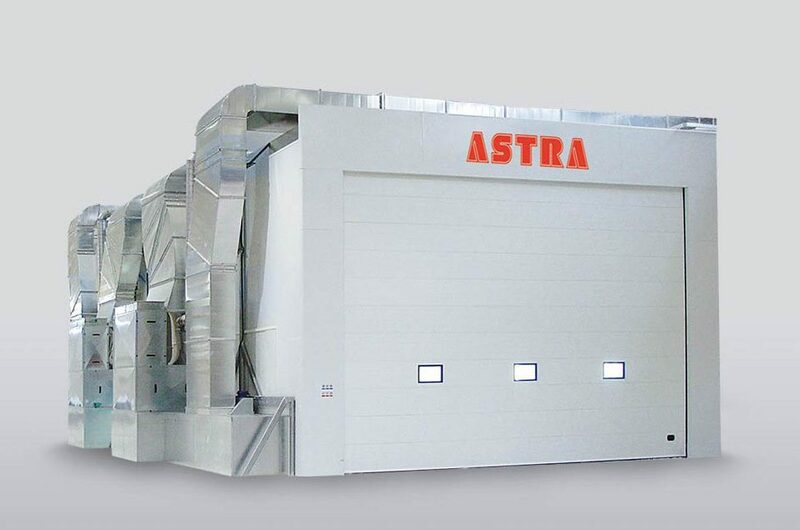 ASTRA builds the boxes fitting its clients needs. Lifting pads with thread, adjustable in height. Automatic stop on lifting/descending stage, to adjust the lifting arms. Versions: with pump, standard control box or ATEX control box. 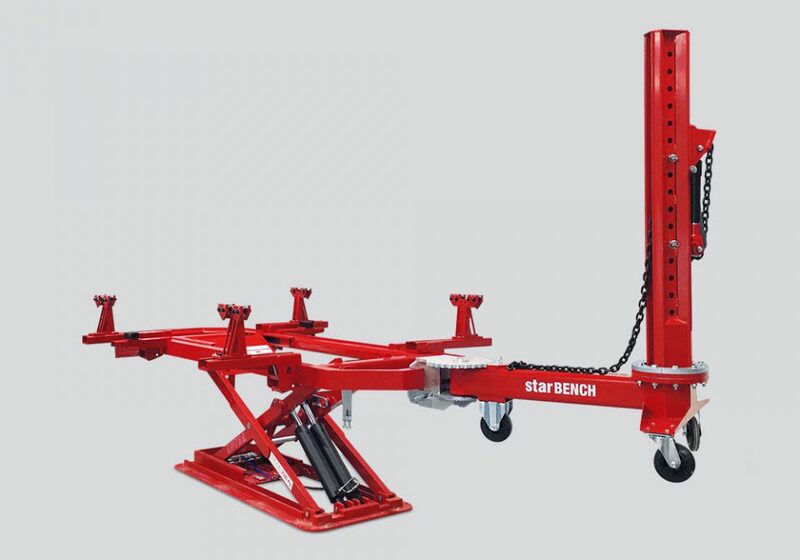 The original system of compact and fast lifting for the automotive market. 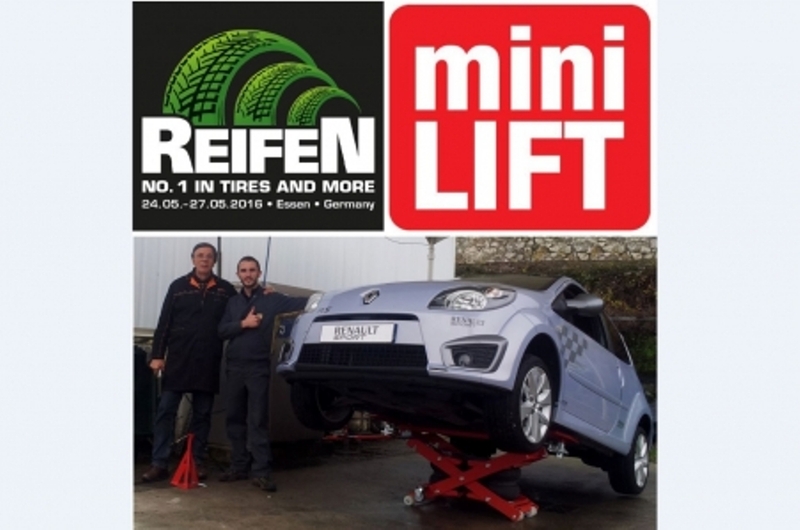 The miniLIFT enables you to work at a right height for: Bodyshops, Garages and Tyres-Shops. 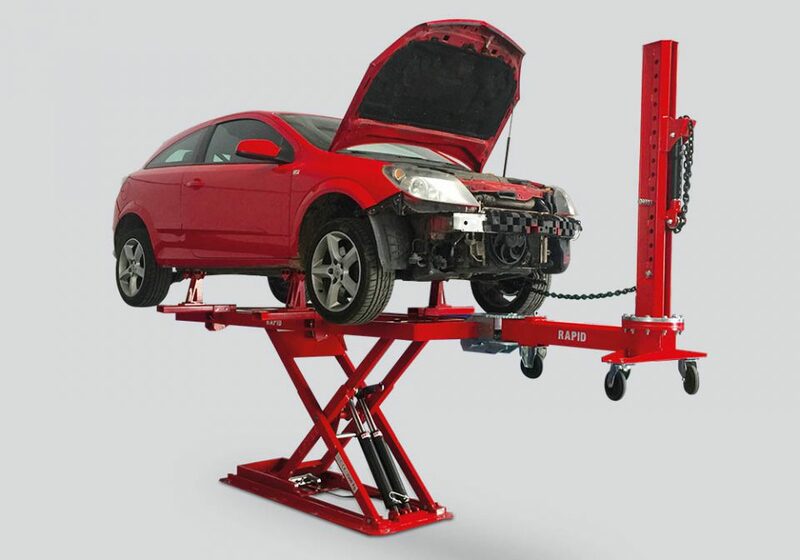 With its small size, you can easily place the lift under any type of car, and then work in the same way as with any other lift. The most revolutionary tool in recent years. 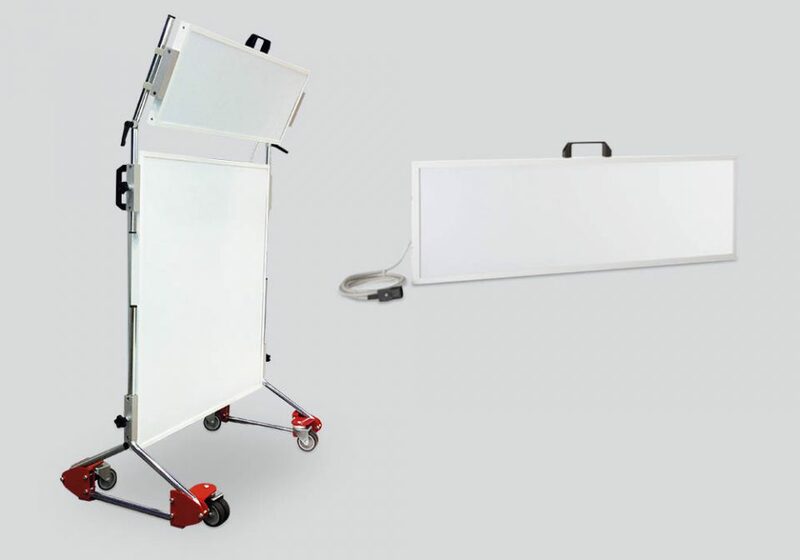 Multipurpose lift which converts easily into a trolley. 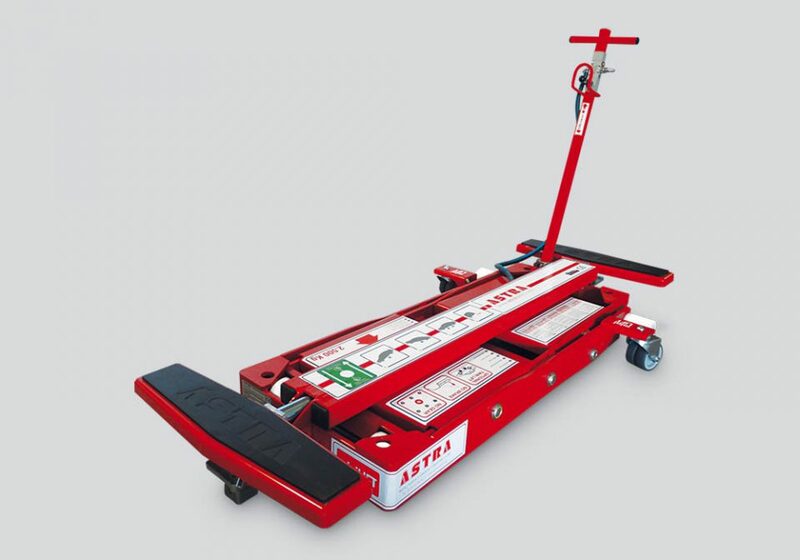 Lower pro le than AE100.1 and foldable handle to keep the working area free during use. Super-slim pro le (only 10 cm) to t the car quickly. It can be flush mounted. New lifting supports with height regulation with thread. High quality and 3.000 kg capacity (4.200 kg CE test). 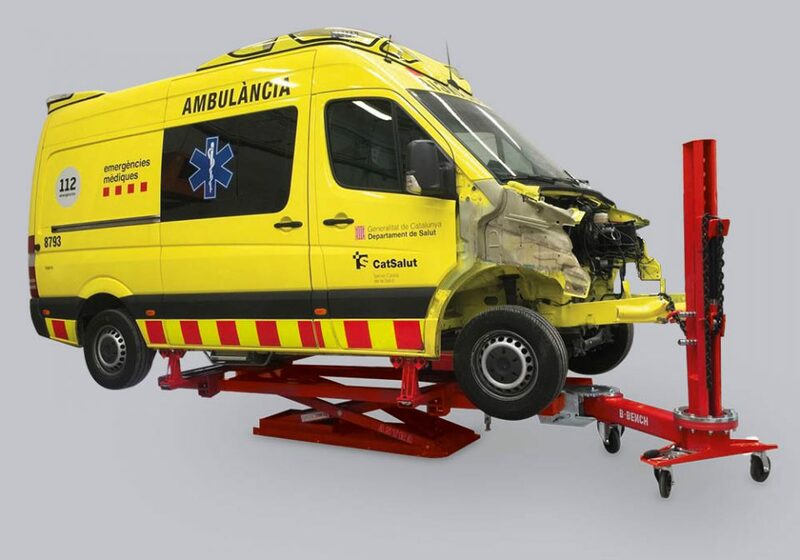 Revolutionary "Lift&Move" System, which enables the vehicle to be moved with the same lift between different areas. Very suitable for long term repairs. 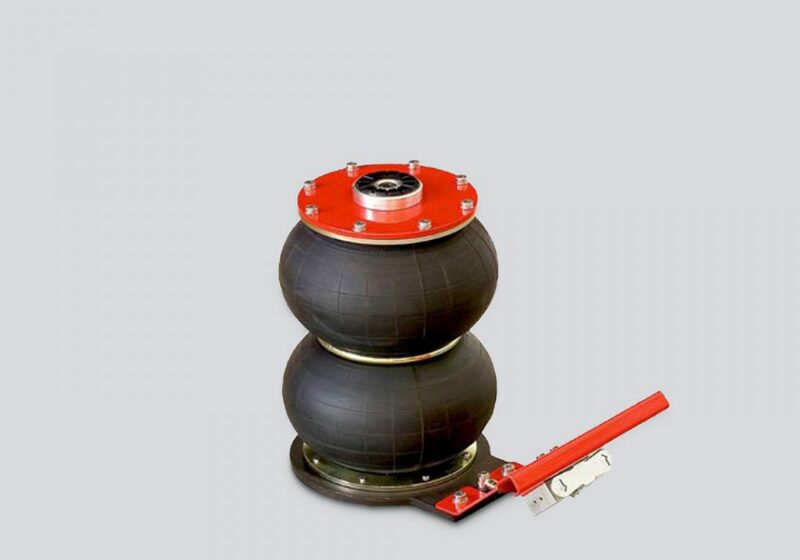 The powerLIFT.R wheels have large diameter and its bearings allow easy movement of the vehicle. 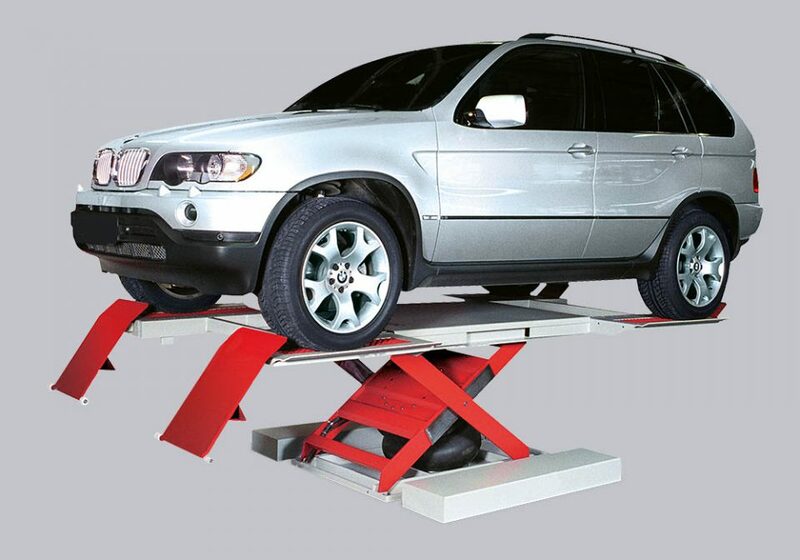 Very easy and fast lifting with air spring for cars up to 3.300 kg Two versions available: on ground or flush mounted. 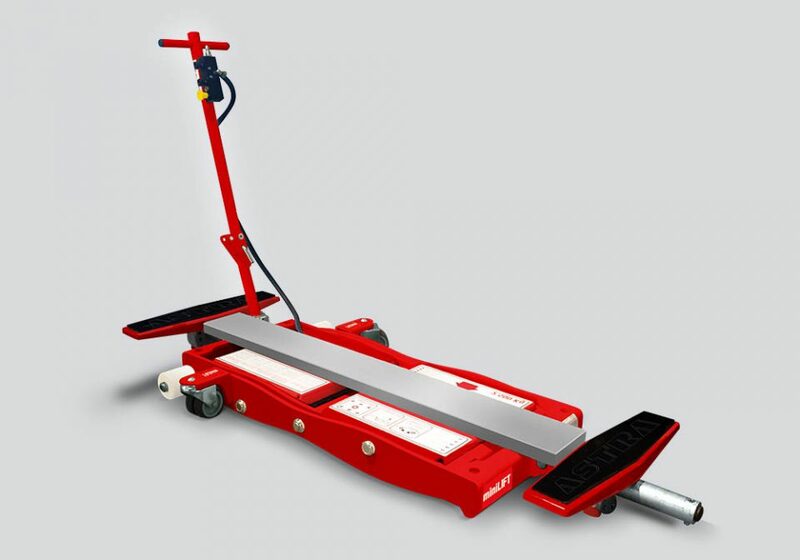 Ideal for Prep Bays, Paint Booth or directly on concrete. ATEX operated, allows you to work easily at any height on trucks and coaches, inside and outside the booth. 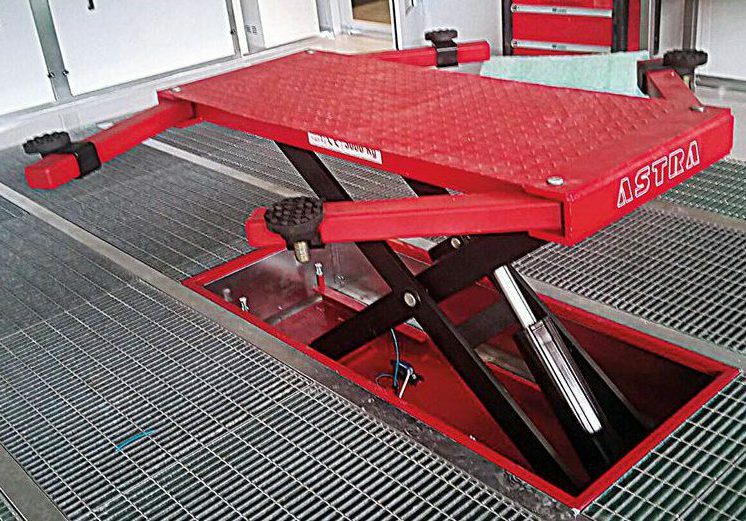 Safety system to lower the platform from the bottom. 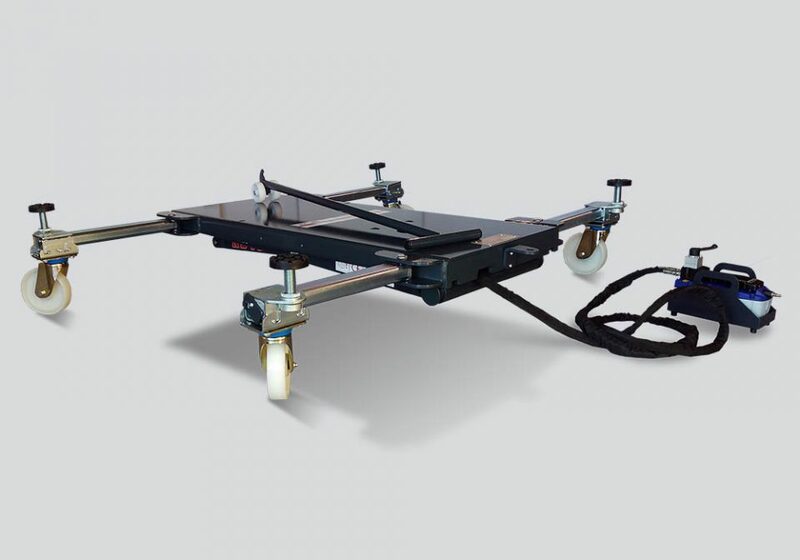 Large platform with capacity for 2 people and 300 kg. Pneumatically controlled jacks consisting of a highly resistant diaphragm and internal telescopic guide. These jacks are fitted with a limit stop device as well as a safety valve making them absolutely reliable in the case of excessive loads. 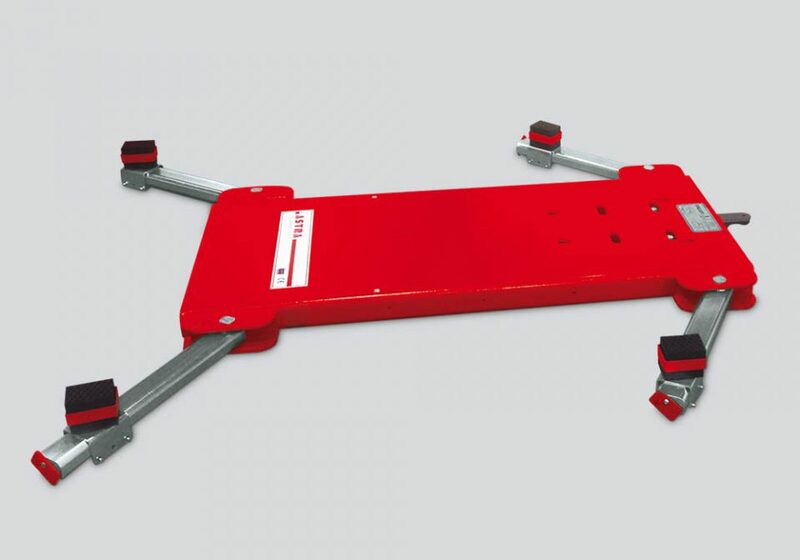 Silent, simple and lightweight, they are ideal for tyre repairers and bodywork shops in view of the fact they can also be used on column lifts. Aluminium device, easy to use, for measurement during straightening processes. Fully updateable CD with Software, datasheets and pictures. Supplied with 2 additional extensions, allowing to measure from 80 to 2800 mm. 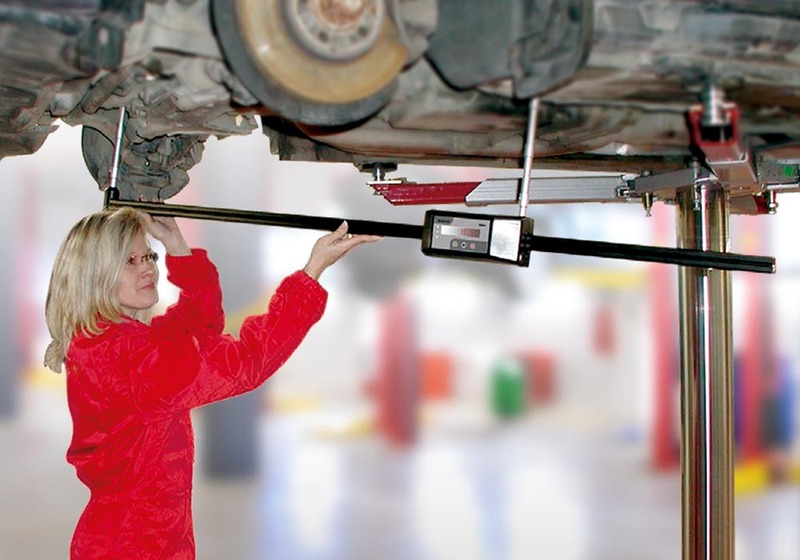 It offers measuring reports, like the certificate of the repair process. 3D measuring device for vehicle diagnostics and damage estimation Full Software with datasheets and detailed pictures on measuring points (1-year update included). The Wireless connection allows a direct data to be transferred quickly. Versatile measuring reports serve as certificates on professionally accomplished repairs and internal control. The unique endothermic and portable drying system. The endothermic wave makes possible an homogeneous dry and it's less aggressive than the traditionar IR. Large surface of 1m2 and energy-saving.